To Cite: Ghana S, Hakimi S, Mirghafourvand M, Abbasalizadeh F, Behnampour N. The Effects of Abdominal Binder on Wound Healing and Consumed Pain Medications After Cesarean Section: A Randomized Control Trial, Iran Red Crescent Med J. 2017 ; 19(4):e44119. doi: 10.5812/ircmj.44119. Background: Wound complications and pain are major causes of morbidity after cesarean section (CS). Although medications are safe for use by mothers after CS, many females prefer non-pharmaceutical methods. An abdominal binder is a complementary therapy, commonly used post-major abdominal surgery. Objectives: There is limited evidence about the effect of abdominal binders. The aim of this study was to investigate the effects of an abdominal binder on wound healing and consumed pain medication. Methods: This randomized controlled trial included 178 females, who had undergone non-emergency CS at 1 of the 3 hospitals in Gonbad-e Kavus, and Golestan, northeast of Iran. In the intervention group, patients were administered abdominal binders, in addition to routine care. The binder was used for 2 days after the patient was admitted to the surgery ward. The control group received routine care. We used the demographic data questionnaire, questionnaire for cataloguing analgesic medications taken by participants (each 6 hours after CS), and Redness, Edema, Ecchymosis, Discharge, Approximation of wound edges (REEDA) scale for assessment of wound healing. The participants provided their written consent for participation in this study. Results: The mean (SD) age of the participants was 26.3 (5) years. Mean (SD) REEDA score was 0.4 (0.5) in the intervention group and 0.5 (0.8) in the control group. The median (quartile 25-75) REEDA score was 0 (0-1) in both groups. Mean REEDA scores did not differ significantly between the 2 groups (P = 0.724). Significant differences were observed in the approximation of wound edges in the intervention group 5 days post-CS (P = 0.007). Administered analgesic medications did not differ significantly between the 2 groups (at 6 hours in suppository, and 6 and 24 hours post-intervention in intramuscular of injection narcotics). Significantly fewer analgesic medications were administered in the intervention group when compared with the control group (P = 0.001). Satisfaction did not differ significantly between the 2 groups (P= 0.443). Conclusions: In this study, the abdominal binder was effective in pain medication consumption at some intervals. However, it had no healing effect on CS scars. The established upper limit for the rate of Cesarean Section (CS) is 15%, according to the world health organization (WHO, 2008) (1). However, this has increased considerably over the past few decades (2). Cesarean section prevalence was reported as 48% in Iran in 2013 (3). The complications of CS are classified to short- and long-term (4). Short-term complications include hemorrhage, pain, excessive use of pain medication, infection, damage to pelvic organs, and maternal mortality. Pelvic pain, emotional problems, and infertility are among the long-term complications of CS (5-9). The total rate of side effects after CS was estimated as 11.6% (10). Wound complications are a major cause of morbidity after CS (11). The prevalence of wound infection and dehiscence after CS is reported as 3% to 15%. These complications influence quality of life, provoking anxiety in the new mothers. Wound infection post-CS is associated with re-hospitalization, imposing an economic burden on the patient and their family. The heavy economic burden and relative failure of drugs to reduce wound infection means alternative methods are typically used to prevent infection. Pain is the most common CS complication (12). Between 50% and 70% of patients experience pain post-CS (13). The pain experienced depends upon the pain threshold and responsiveness of patients (14). The aim of post-operative pain management is to reduce, eliminate or prevent complications (12). Insufficient postoperative pain management causes inactivity and/or breathing problems, both of which play an important role in the development of thrombosis and atelectasis (15). Although medications are safe for use by mothers post-CS, many females prefer non-pharmaceutical methods (16). A few studies on the advantages of non-pharmaceutical methods, including complementary and alternative medicine, have been conducted (17). Any method or device to prevent post-operative complications should be effective, safe, easy to use, controllable, cost-effective, and acceptable to patients and physicians (18, 19). Abdominal binders are a complementary therapy for major abdominal surgery, such as laparotomy, CS, cardiac surgery, etc. (20-24). Abdominal binders reduce pain by compressing the abdomen post-CS. Moreover, compression increases blood flow and reduces inflammation at the incision site, both of which are effective in rapid tissue repair (25). However, there is limited evidence on and controversy over the effect of abdominal binders on post-operative CS complications. In 1 study, 94% of participants, who underwent laparotomy, wanted to use abdominal binders to prevent wound dehiscence. The results of 2 studies indicated that using an abdominal binder might reduce the risk of complications by enhancing patient comfort (26, 27). A study by Giller, in which the effect of abdominal binders post-CS was examined, indicated no effect on post-operative pain, perceived distress, hemoglobin, hematocrit, and extent of painkiller consumption (27). Gustafson used such a binder to relieve pain the first day post-surgery; hemoglobin and hematocrit levels were unaffected (21). Nowadays, efficient non-medicinal alternatives are required to manage multiple complications. Furthermore, the role of abdominal binders in the healing process of post-abdominal surgery should not be ignored. Therefore, it is necessary to recognize the effect abdominal binders in managing the most salient CS complications. Given the limited available evidence, this study aimed at assessing the effect of abdominal binders on wound healing and pain relief medication use post-CS. This randomized controlled trial was conducted with 2 parallel arms on 178 females, who underwent elective CS in 1 of 3 hospitals in Gonbad-e Kavus, a region with an ethnically diverse population in Golestan province, northeast Iran. Two of these hospitals were government general hospitals, and 1 was a private hospital. The number of beds in the gynecology ward was approximately 30 in each hospital. The ethics committee of the Tabriz University of Medical Sciences approved the protocol of this research (TBZMED.REC.1394.9). The trial was registered in the Iranian registry of clinical trials (IRCT2015042521917N2) before starting participant recruitment. Inclusion criteria were as follows; first or second parity, being literate, Body Mass Index (BMI) between 18.5 and 25.9, hemoglobin > 11 mg/dL in the first trimester, term, singleton, and uncomplicated pregnancy, Pfannenstiel incision on the skin, and Kerr incision on the uterus at the site of previous CS (if previous CS had been performed). Exclusion criteria were as follows; inability to tolerate the binder; unwillingness to participate in the study; smoking or using opioids; presence of underlying disease, self-reported by the mother; presence of preeclampsia or eclampsia; emergency CS; rupture of membrane for more than 6 hours; duration of more than 1 hour for current CS; classic incision of the uterus; general anesthesia; simultaneous surgeries, including hysterectomy, myomectomy, and tubal ligation; severe hemorrhage, bleeding disorders or use of anticoagulants, such as heparin or warfarin; and damage to body tissue during CS. Before the study commenced, participants were ensured that their information would remain confidential. All necessary information, including the aims and benefits of the study, was provided for the participants. Written informed consent was obtained. Participants were randomized to 2 groups using random blocks of 4 or 6 (Random Allocation software) with a ratio of 1:1. For allocation concealment, the type of group was written on a piece of paper, placed in opaque envelopes, and numbered sequentially. An individual, blind to the enrollment, data collection, follow-up, and analysis, performed the allocation. Post-CS, if the mother met the required inclusion criteria and completed the demographic forms, her name was written on an envelope and the envelopes were ultimately opened by 1 of the researchers. Then, they were allocated to either the intervention or the control group. In the intervention group, abdominal binders (Paksaman, made in Iran) were fastened for the patients by the researcher, besides receiving routine care and, with regards to a 5% reduction of abdominal circumference. For application of the appropriate abdominal binder, the female’s abdomen was measured by a standard meter, then, according to the abdominal circumference, the binder was fastened for 2 days after transfer of the patient to the surgery ward. The binder was opened between 10 pm and 8 am. The researcher checked the binder every 4 hours. Both intervention and control groups received routine medication and care. We designed a researcher-made demographic data questionnaire and a questionnaire to evaluate the analgesic medications consumed (every 6 hours post-CS). In addition, we used the Redness, Edema, Ecchymosis, Discharge, Approximation of wound edges (REEDA) scale to assess wound healing and participant satisfaction. To assess the content validity of the questionnaire, we used the Content Validity Ratio (CVR) and the Content Validity Index (CVI). Ten faculty members measured CVR and CVI (CVI = 0. 89 and CVR = 0.74). Both were higher than the optimal cut-off. The REEDA Scale is a standard tool to evaluate inflammation and tissue healing. It includes 5 items: redness, edema, ecchymosis, discharge, and approximation of wound edges. Each item was scored from 0 to 3. A 0 point indicates no sign and 3 points is highest sign (28). The reliability of the Persian version of this questionnaire was calculated as 0.81 (29). The REEDA scale was administered on day 5 post-CS in the hospital clinic. Administered analgesics were recorded by the researcher every 6 hours post-CS, according to medical records. 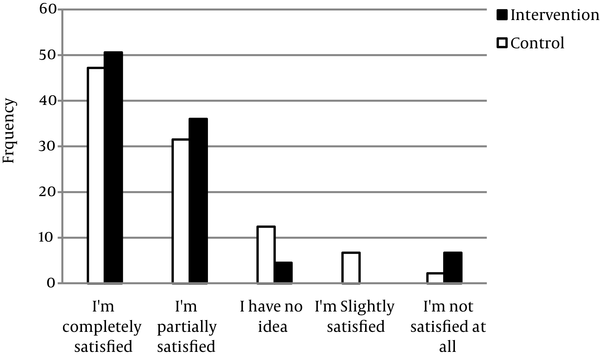 Patient satisfaction was evaluated using a 5-point Likert scale questionnaire, 5 days post-CS. The participants were followed up by phone on the fourth day post-CS. During the phone call, we reminded them of the next appointment (visiting) at the hospital clinic. All participants completed their program (visiting in the clinic). No follow-ups were missed. Sample size was calculated using the power and sample size calculator software (PS), 3.1, based on a study by Cheifetz et al. (18). Overall, 81 females were enrolled in each group, with the following considerations, power = 80%, SD1 = 7.8, m1 = 10.5, SD2 = 11.3, and m2 = 14.5. With respect to 10% loss to follow-up, a final adequate sample size was considered as 89 females in each group. We used the intention to treat. Data were analyzed using SPSS software, version 16. The normal distribution of data was confirmed using the Shapiro-Wilk test. In addition, descriptive statistics, such as frequency, percentage, central, and dispersion parameters were used. Independent t test, Fischer’s exact test, Chi-square, Chi-square for trend, and U Mann-Whitney were used as appropriate. P values of < 0.05 were considered statistically significant. This study was conducted from January to October 2015. Of the 496 females initially enrolled in the study, 178, who met the inclusion criteria, were selected and allocated to the intervention and control groups (N = 89 in each group). Two participants were excluded owing to binder intolerance and hemorrhage (Figure 1). Normal distribution of the data was assessed using the Shapiro-Wilk test. All data except BMI was normally distributed. Mean (SD) participant age was 26.3 (5.0) years. Overall, 86.5% of participants were housewives, 38.2% had high school diplomas, and 88.2% were from Fars or Turkmen ethnicity. Cesarean Section was performed in 78.1%, owing to maternal indications. No significant difference in socio-demographic characteristics was observed between the groups (Table 1). bMedian (Quartile 25 - 75). Two individuals were excluded owing to hemorrhage and binder intolerance. Mean (SD) REEDA score was 0.4 (0.5) in the intervention group and 0.5 (0.8) in the control group. Mean (SD) REEDA scores did not differ significantly between the 2 groups (P = 0.724). Significant differences were observed in the approximation of wound edges in the intervention group, 5 days post-CS (P = 0.007) (Table 2). aMann-Whitney U test, REEDA: redness, edema, ecchymosis, discharge, approximation of wound edges. Mean (SD) and median (Quartile 27-75) of REEDA scale items and total score, compared between the 2 groups. The administered analgesic medications did not differ significantly between the 2 groups (at 6 hours in suppository, 6 and 24 hours post-intervention in intramuscular of injection narcotics). 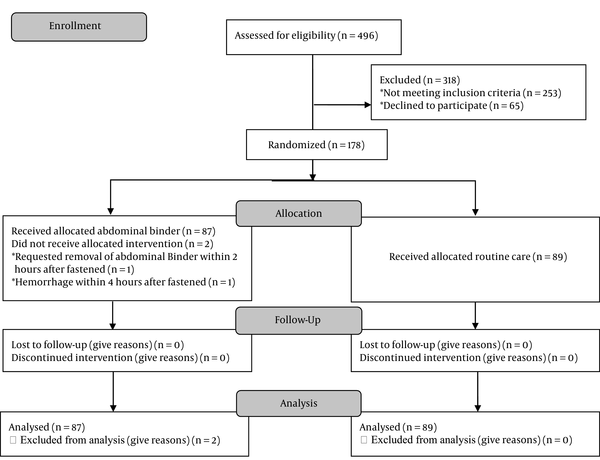 However, significantly fewer analgesic medications were administered in the intervention group, compared to the control group (P = 0.001; Table 3). Participant’s satisfaction was 50.6% in the intervention group and 47.2% in the control group. Comparison of injection vs. non-injection analgesic administration between the 2 groups. There was no significant difference between the 2 groups with regards to satisfaction (P = 0.443, Figure 2). Illustrates the percentage of complete participant satisfaction in the intervention and control groups. The aim of the current clinical trial was to evaluate the effects of an abdominal binder on wound healing and amount of pain medication consumed in 178 post-elective CS females of parity 1 or 2. A few studies have examined the effects of abdominal binders on CS complications (21, 23, 27). Some have addressed how abdominal binders impact wound healing (20, 22, 24) and pain medication consumption (21, 30) post-surgery. The findings of the present study suggest that abdominal binders affect only the approximation of “wound edges” among the 5 components of the REEDA scale. No significant difference was observed between the 2 groups in terms of other REEDA scale components. Zhang et al. (2016) demonstrated that elastic and non-elastic abdominal binders proved ineffective in preventing wound infection or dehiscence during the immediate postoperative period and up to 14 days post-abdominal surgery (24). Bouvier et al. (2014), in their review study, showed that abdominal binders prevent wound dehiscence in 83% of patients post-laparotomy (20). Furthermore, Gustafsson et al. (2013) stated in the guidelines for postoperative care after elective colon surgery that abdominal binders helped wound healing (22). Wong et al. (2001) concluded that abdominal binders caused wound infection in 6 of the patients (4 from the treatment group and 2 from the control group) post-CS, yet, the difference was not significant between the 2 groups (23). Bereznicki (2012) reported that several factors affected post-CS wound healing, including twin pregnancy, fever, chronic rhinorrhea, history of chronic systemic diseases, immunosuppressive medications, perioperative sterilization non-compliance, lack of prophylactic antibiotic, surgery duration longer than 90 minutes, surgical technique, hemostasis, suture type for subcutaneous repair, and malnutrition (31). The difference between the results obtained in this study and those of previous work is attributable to multiple factors influencing wound healing and the study period, as well as the emotional, psychological, and social factors of participants and the type of surgery. Pain medication consumption was measured every 6 hours post-intervention, in both groups. The results revealed no significant differences between the 2 groups at 6 hours (as suppository or injection) and at 24 hours (as injection) post-intervention. However, the intervention group consumed significantly less pain medication than the control group at other intervals. In a number of similar studies on the effects of abdominal binders post-laparotomy and major abdominal procedures (Ali et al., 1983) (30), post-CS (Gillier et al., 2016) (27), and post-midline laparotomy incision (Larsson et al., 2009) (19), abdominal binders did not decrease analgesic consumption. Other researchers have investigated pain severity between the first and fifth day post-major abdominal surgery, as measured by the short-form McGill Pain Questionnaire (SF-MPQ; Arici et al., 2016) (32); the first day post-CS, using the Visual Analogue Scale (VAS) (Gustafson et al., 2015) (21) and between the first and fifth day post-major abdominal and laparotomy, using the SF-MPQ (Cheifetz et al., 2010) (18). Christoffersen (2014) demonstrated the ineffectiveness of using an abdominal binder post-surgery in umbilical and epigastric hernia repair; movement limitations, fatigue, quality of life, seroma formation, and pain remained unimproved (33). The findings in these studies confirm that abdominal binders significantly reduce pain in the intervention group. It should be noted that differences in pain level are attributable to a number of variables, including age, gender, economic status, education, employment, and other potential confounders, such as disease type and duration (34). Other variables influencing pain intensity and unpleasantness are ethnicity and race differences, as well as pain tolerance level (35-37). Inconsistencies between current and previous findings are potentially due to differences in factors affecting pain control and tolerance levels in participants. In addition, differences could be attributed to the pain measurement methods used in various studies. We used the number of pain medications as an objective criterion for assessing pain level, whereas Arici et al. (2016) (32), Gustafson et al. (2015) (21), Cheifetz et al. (2010) (18), and Christoffersen, et al. (2014) (33) used subjective criteria. In this study, 1 case of bleeding was observed as the only adverse incident caused by an abdominal binder. The researchers did not find any bleeding incidence in the literature. Respiratory complications, such as reduced recovery time and forced vital capacity, owing to the abdominal binder, were the only adverse effects reported in the studies (18). The randomized allocation and blocking constitute strengths of this study. Limitations of the study included the need to remove abdominal binders to sleep at night, the inability to blind this procedure, and the brief follow up duration. Wearing the abdominal binder for a longer time might have yielded different results. The small sample size and homogeneity of participants were limitations. In this study, an abdominal binder effectively reduced pain medication consumption at some intervals. However, it did not heal CS scars. Further research is required to identify the benefits of post-CS abdominal binders. This research was performed as part of a midwifery MSc thesis at Aras Branch, Tabriz Nursing and Midwifery school. Hereby, assistance, cooperation, and funding of the Research Deputy of Tabriz University of Medical Science and the participants is appreciated. Authors’ Contribution: Samieh Ghana designed the protocol, administered the intervention, collected the data, and prepared drafts of the manuscript. Sevil Hakimi and Mojgan Mirghafourvand designed and supervised the study. Nasser Behnampour performed the statistical analyses, and read the drafts critically. Fatemeh Abbasalizadeh designed the protocol, administered the intervention and read the drafts critically. All authors read and approved the final version of the manuscript. Funding/Support: The research proposal was financially supported Tabriz University of Medical Sciences.